Arthrozene is a 3-step solution that attacks joint pain and stiffness at its root. Its clinically tested and patented ingredients decrease inflammation, slow down cartilage degradation, and increase lubrication. This helps increase flexibility and pain-free movement so you can get back to the daily activities you enjoy. What are the ingredients in Arthrozene? When it comes to Arthrozene, your satisfaction is our top priority. That's why all orders are backed by a 90-day, full-money-back guarantee (less any S&H). If you're not satisfied with your purchase - for any reason whatsoever - simply contact us to request a prompt and courteous refund. How do I take Arthrozene? For best results, take one (1) capsule, once per day, with a glass of water on an empty stomach. No. This product is both caffeine and stimulant-free. 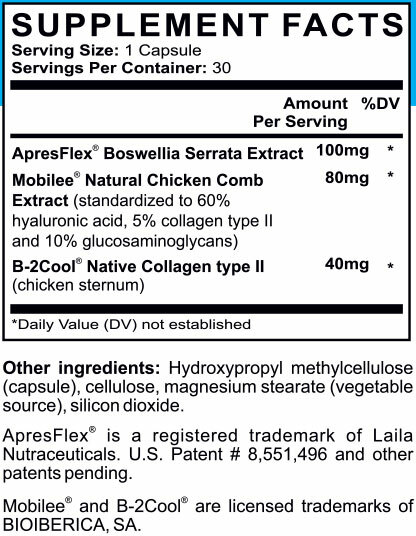 Arthrozene is an all-natural formula that is considered safe and extremely effective for nearly everyone. That said, if you take prescription medications or have a medical condition, we recommend that you show a bottle of Arthrozene to your physician for proper approval. You can always return it later with our 90-day money-back-guarantee. However, do not take Arthrozene if you are pregnant, nursing or under the age of 18. Will anything else be sent to me (or billed to me) after I order? We use 256-bit encryption to protect your sensitive information. This is a similar security protocol used by major banks and large e-commerce websites such as Amazon.com. Still can't find your answer? Email us at support [AT] arthrozene.com or call us at 1-800-392-4727 and speak with one of our representatives. 3 powerful joint health ingredients: Arthrozene is the next generation formula that offers relief from discomfort, while improving mobility and flexibility. Stay in touch for special offers and discounts. Learn about natural health supplements and practices by joining our Email list. Copyright © Fisico Inc. 2019. All rights reserved. †These statements have not been evaluated by the Food and Drug Administration. This product is not intended to diagnose, treat, cure, or prevent any disease. This information is not intended to be a substitute or replacement for any medical treatment. Please seek the advice of a healthcare professional for your specific health concerns. Individual results may vary.